Canterbury class outweighed Albanian endeavour in this breathless encounter on a truly Spring day. Interestingly enough all the points in this 19-5 defeat were scored at the same end. The first half hour of the corresponding match earlier in the season had left Albanians bereft of ideas when Canterbury managed the elements in dramatic fashion. OAs fared much better this time. In a first half dominated by the visitors Albanians kept a clean sheet against marauding attacks and only conceded a first try at the start of the second quarter when Ricky Mackintosh finally breached a stubborn defence, Harvey Young improving. The men of Kent pressed for the remainder of the period, scoring two further tries by Sean Stapleton and Tristan King, the first of which Young converted. The second half saw a gradual turn around in fortune as OAs took the fight to their tormentors. A certain lack of precision in handling and decision making held the hosts back for long minutes although opportunity beckoned often enough. 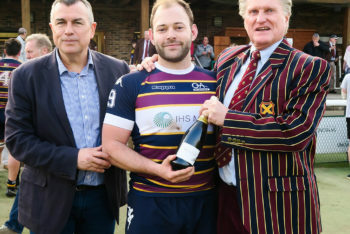 Dan Watt, a true skipper on the day, scored OAs solitary try on 58 minutes. The rest of the tie was spent in the Canterbury 22 where their rugged defence kept out Albanian attackers. Canterbury did enough to win this contest and cement their place towards the top of the heap. OAs will look at squandered chances but will not be too distressed to come second to strong opponents. There is no gallery currently available for this fixture.